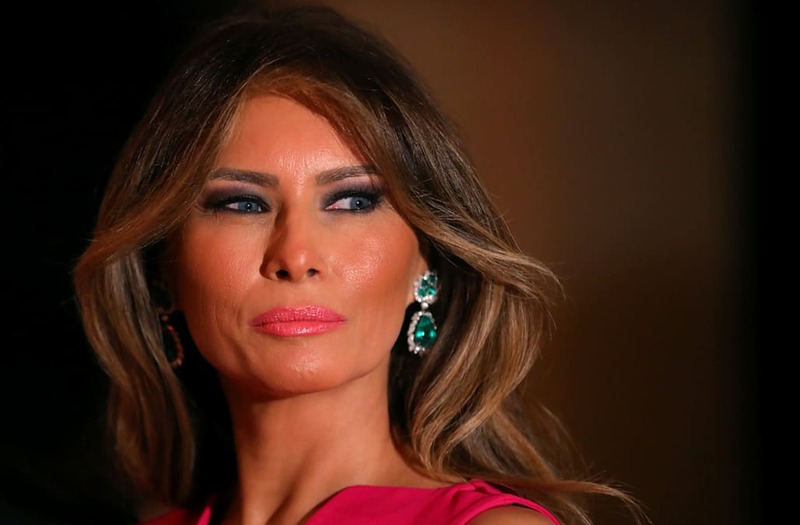 It's no secret that first lady Melania Trump's relationship with the fashion world has been a contentious one since her husband, President Donald Trump, was elected in November. At the time, some high-profile designers vowed never to dress FLOTUS, a few remained neutral and others insisted they'd be happy to. The controversy came to a head as the inauguration grew closer, leaving many to wonder whose designs the former model would don. Ultimately, Melania turned heads on Inauguration Day when she emerged in a pale blue ensemble by iconic all-American designer, Ralph Lauren -- and not everyone was happy. Lauren immediately began receiving backlash for the move, with some Twitter users even urging for a boycott of the American brand. Since the inauguration, Mrs. Trump has largely stepped out of the spotlight for a bit. However, as she greeted her husband Friday in Palm Beach, all eyes were on her and her fashion choices once again. Walking across the tarmac Friday, Melania was seen in a red Givenchy cape-sleeve shift dress (accompanied by flats, might we add). She then opted for a pink Christian Dior gown at the Red Cross ball Saturday night. As for Super Bowl Sunday, she sported leather pants by The Row and a sweater by Derek Lam (who said in November that he didn't see himself "getting involved with the Trump presidency"). It's not the fact that she didn't opt for heels on Friday that people are talking about, though. As The New York Times points out, in FLOTUS' first major appearance since the inauguration, she turned to a European designer -- which comes as a bit of a surprise after her highly publicized nod to American fashion by choosing Ralph Lauren on January 20. Furthermore, as the NYT puts it, "...There is a contradiction implicit in her choices of clothing, given her husband's promise in his Inaugural Address that 'Buy American' would be a tenet of his administration." Mrs. Trump's senior adviser responded to the Times, saying, in part, "Mrs. Trump buys from an international mix of brands because that is what reflects her uniquely American life experience and style." In other words, it sounds like FLOTUS is going to keep us on our toes as far as her style goes. According to the report, Givenchy played no part in dressing Mrs. Trump over the weekend, and Dior hasn't issued any statement.